The Swedish Club has published some lessons learnt from a machinery failure. The six cylinder, medium speed type engine sustained serious damage serious damage and had to be renewed. Additionally, the turbo charger had to be overhauled. The vessel in question was in ballast and at anchor, waiting for further instructions. After seven days the weather got worse and the ship’s anchor dragged. The anchor was heaved up and the vessel started to slow steam in the area. Moreover, the turbo charger had to be overhauled as the nozzle ring had broken. The complete lubrication system had to be carefully cleaned and flushed. The vessel had to be off hire for about two weeks. In addition, the pistons in cylinder units numbers 1 and 3 were melted down in certain areas and the skirt in number 4 was torn. Liners were also scuffed. The cylinder lubrication channels were clogged and so cylinder lubrication had been inactive. The lubrication oil pump had deteriorated because of the hard impurities in the lube oil system. – Due to high exhaust gas temperatures, the engine was under a high thermal load, which finally caused it to breakdown. 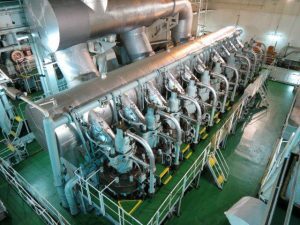 – Engineers will be sent on four stroke engine training courses.